I first went to Gooi Nara in late 2016; I was on what I suppose you could loosely have classed as a date, with somebody I suppose you could loosely have classed as a vegan. I sat there trying to sound enthusiastic about tofu (not a skill I’ve ever mastered, truth be told) and then I ate my disappointing bibimbap while all around me, the other diners were wolfing down Korean barbecue, grilling a plethora of delectable looking meats on the hot plate in the middle of their tables. They all seemed to be really enjoying themselves, and as the weeks passed I came to think of that evening more as a metaphor than as an actual meal. Naturally I wanted to take a more suitable dining companion when I went back on duty and, on reflection, there was only one suitable candidate – my friend Claire. 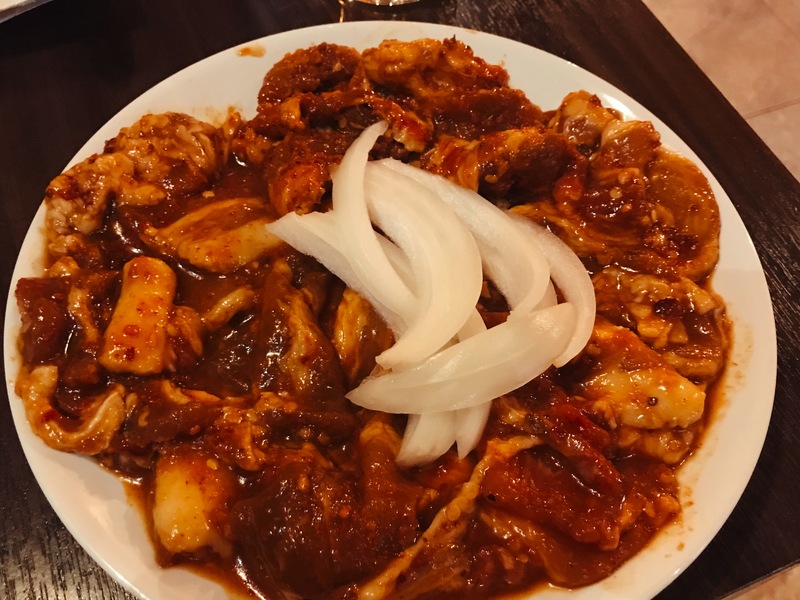 Not only had she actually been to Korea but she’d written a review of Korean restaurant Soju for Explore Reading which was responsible for teaching me pretty much everything I knew about Korean barbecue (admittedly not much). Much has happened since Claire last accompanied me on a restaurant review, most significantly that Explore Reading had begun publishing restaurant reviews. A lot of people have asked me if I mind that, and of course I always say I don’t mind in the slightest, Reading benefits from a variety of restaurant reviews and that it’s not right for one site to have a monopoly. That said, it’s a running joke between Claire and I that she’s going to take me down; first she took on Alt Reading, which finally announced that it was quitting – for the time being, anyway – this week, and now she’s coming after me. I’m mainly joking, of course. Mainly. In the run-up to our trip to Gooi Nara I make some gags about how it will be like the infamous dinner at Granita where Tony Blair and Gordon Brown agreed when the former would stand down in favour of the latter. After doing the joke I realise I’m not entirely comfortable being cast as everybody’s favourite grinning war criminal. “I’ve always had a soft spot for Gordon Brown,” says Claire, “but then I like an underdog.” It made sense, on reflection: we each spend a lot of time championing Reading, so perhaps we both do. In any case, I strolled up the hill to the restaurant on a quiet Monday night with no plans to announce my retirement. I’m always struck by how often I start a description of a restaurant by saying “it’s a long thin room”, like it’s the equivalent of “it was a dark and stormy night”. Well, brace yourself, but Gooi Nara is indeed a long thin room, but a surprisingly attractive one. One side was covered in slate-effect tiles, with a couple of wood stores in the wall that would no doubt come in completely useless in fuelling the fake fire showing on the wall-mounted widescreen television. The other side was a vibrant burnt orange, with oblong shelving units populated, in a slightly OCD manner, with little objets. There were dark wooden beams spanning the ceiling, such a pleasant change from the ten-a-penny industrial pipes and bare bulbs which always give a place a slightly unfinished look. I really liked the place. The first surprise came when I looked at the menu. Gooi Nara has a sister restaurant in Guildford called Sushi Nara, and as a result I was thrown to see that aside from a Korean menu there was also a whole menu of Japanese dishes – sushi, sashimi and the like. It was tempting to order some, because Reading still needs an excellent Japanese restaurant and Taberu, on the Oxford Road, is still doing delivery only at the time of writing. On reflection, though, I decided to remain steadfast: I had turned up to eat Korean barbecue, and eat Korean barbecue I bloody well would. Not that you have to do that, of course: the Korean menu alone was massive. There were plenty of starters, although some, like takoyaki (octopus balls) and pumpkin korroke felt like they were on the run from the Japanese section of the menu. There were soup dishes and rice dishes, noodle dishes and hot pots and – as I remembered from my previous trip – plenty of tofu and bibimbap. But the trick with barbecue, Claire told me, was to order your meats of choice, cook them on the hot plate in front of you and dip them in vinegar and sesame oil before placing them on a lettuce leaf, adding kimchee and beansprouts and then wrapping the whole thing up and popping it in your mouth. I’m not the biggest fan of finger food, but put that way it’s hard to imagine a more enjoyable way to eat. 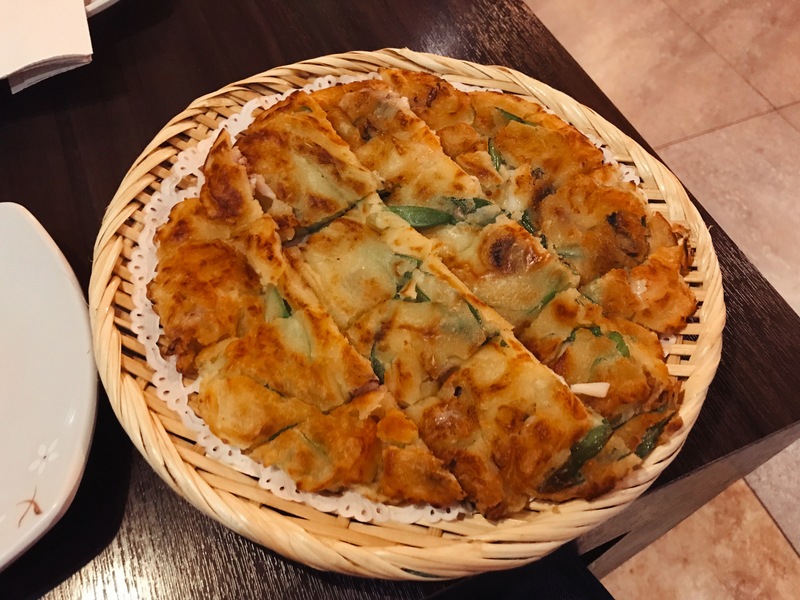 Before that though, we tried one of the starters I had my eye on – the seafood pancake. It turned up cut into squares, on a paper doily on a wicker serving dish, a bit too fiddly and faffy (“We Want Plates need to be told about this” said Claire, waspishly). It was a little fiddly too to pick up with chopsticks and dab into the dish of dipping sauce which, as so often, was too small to be useful. That all said, it really was lovely stuff. Claire told me these were made with wheat flour, but if anything the texture was so starchy that it reminded me of a potato cake – more like a latke than a pancake. Despite that, it wasn’t heavy at all, and the spring onion throughout gave it texture and freshness. I got squid in the pancake, and I may have missed the shrimp – we all make mistakes – but the menu also advertised octopus and I’m pretty sure I’d have noticed that. Still, the pancake was seven pounds fifty, so if it seemed too good to be true, perhaps that’s because it was. The support act out of the way, it was time for the feature attraction. 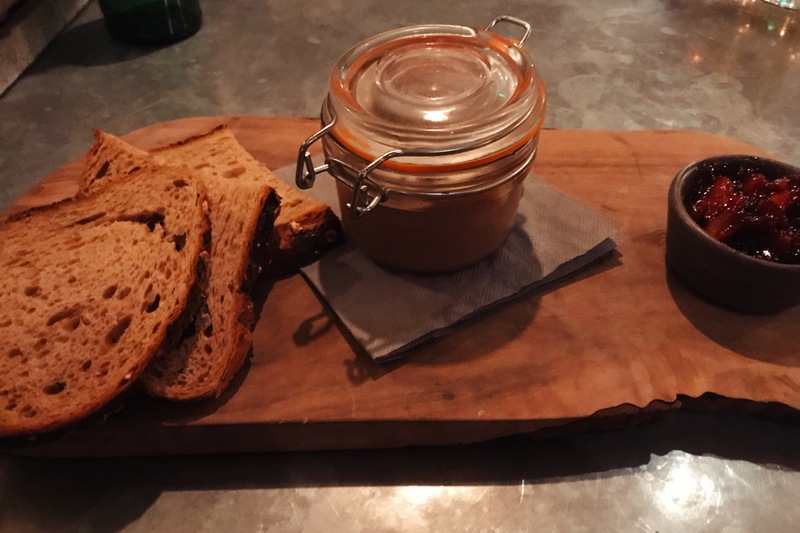 The waiter came and switched on the hot plate at our table, the meat arrived and, not for the first time, I wondered how anybody ever managed to convince themselves that they enjoyed eating tofu. 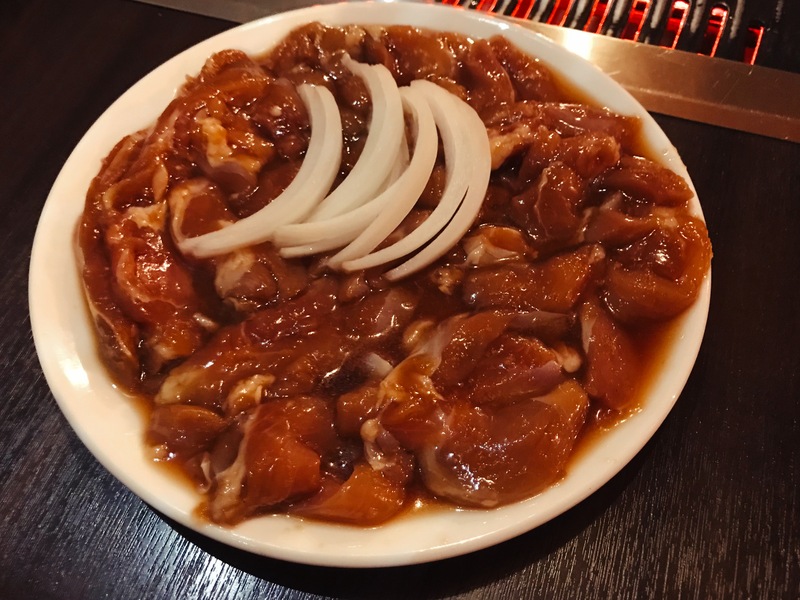 We’d decided to try all three of the main food groups – pig, cow and chicken, don’t you know – and the first to go on the barbecue was the spicy sam gyup sal, long thin slices of pork belly, deep-red with marinade, a veritable bar code of meat and fat. On the hot plate, the smell was terrific and the transformation beautiful, and Claire and I took it in turns to poke and turn with the tongs until it was impossible to hold back any more (I spent most of that time banging on about the Maillard reaction, and Claire spent most of it nodding and humouring me). It tasted even better than it looked or smelled, and I loved the ritual of coating it in vinegar and sesame before tenderly resting it in the centre of a lettuce leaf, topping it with brick red kimchee and devouring the whole lot. The kimchee added sourness and crunch without being quite as fiery as some kimchee can be. The spice on the pork, again, built to a crescendo rather than went off like an explosion, and the whole thing was the kind of dish that you can’t help but grin while eating. 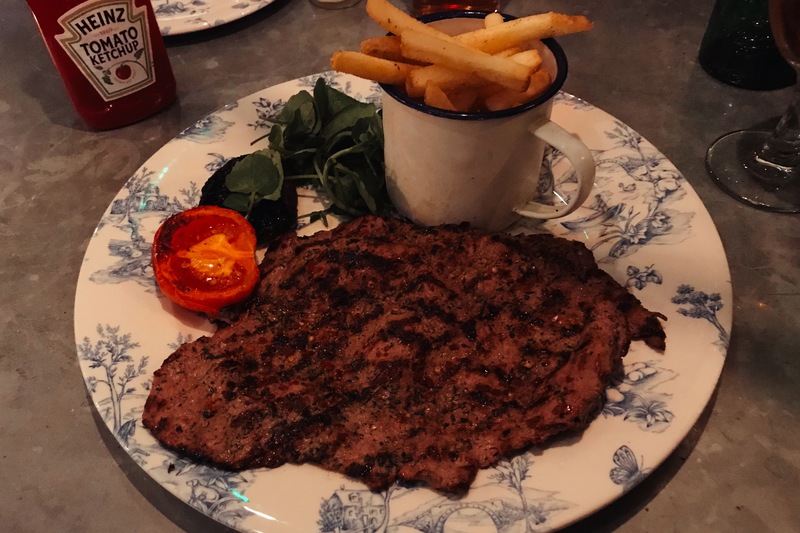 It would be a lazy piece of observational comedy to say that you’re basically paying money to cook your own food, but that would be to underrate the service; every time a hot plate got too crusted with meat and residue to use, the waiter would come along, deftly hook it out with a nifty device and pop in a new one. 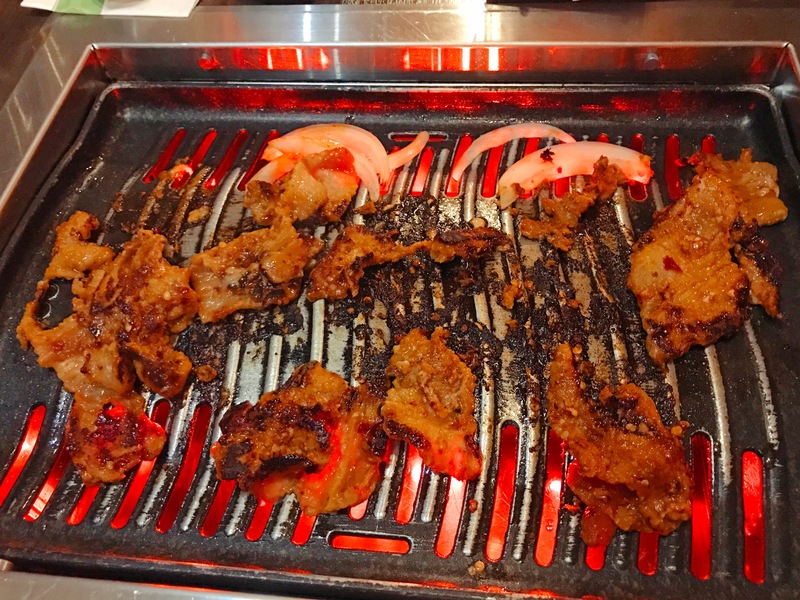 He also gave us advice on what to grill in which order, and regularly kept us topped up with bottles of Asahi (Claire offered to give me a crash course in Soju, but then said it was basically vodka, at which point I found myself really fancying a cold beer). “Do you know how they clean these?” said Claire, probably well aware that my answer, inevitably, would be no. I found myself thinking of those colour supplement adverts that tell you vinegar has magical powers and can clean pretty much everything around the house. It would be an even more lazy piece of observational comedy to say you were expected to chop your food as well, so I decided not to mention it. In any case, more meat was on the way. I wasn’t sure how I felt about the ju-mul luk (the beef) when it arrived, because it was in thick cubes and I had been expecting thinner slices. But any doubts I had were caramelised into oblivion as the beef sizzled on the grill, the coating of garlic and sesame searing and producing the most glorious aroma. It was far more tender than its thickness might suggest, with a splendid whiff of garlic which lingered long in the memory (and possibly even longer on my breath). Last of all, we went for the chicken bulgogi gooi, thighs marinated in soy and sesame. These were probably the most disappointing thing we had – it had been sliced too thinly and broke up into very small pieces on the barbecue. It also had less marinade, so it was the only thing to keep sticking to the hot plate and burning. Still pretty good, but just a bronze medallist in this setting. “It’s a shame really, because bulgogi is the thing in Korean restaurants” said Claire. Claire was right about that. I was also struck by just how good value everything was. Each plate of barbecued meat was a hefty, generous portion and the chicken and pork only cost seven pounds fifty. Even the beef was still less than a tenner. We’d ordered three different plates, but two people could easily get by sharing two – well, two people where one of them wasn’t as greedy as me, anyway. 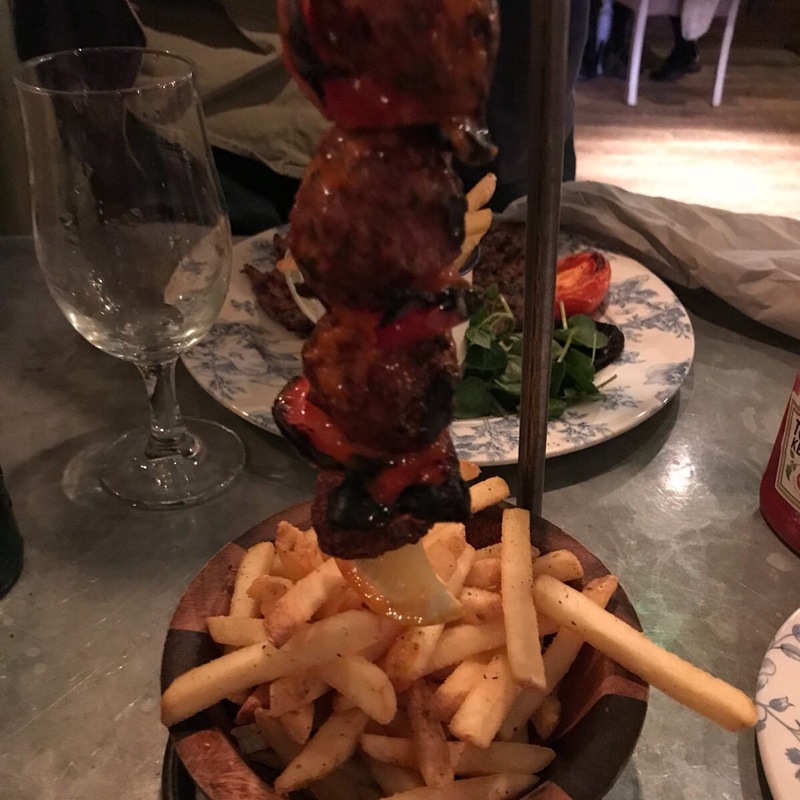 “You can tell this is good”, I said, “because I’m already trying to work out what I’ll have when I come back.” In my mind, I was already mentally choosing between the feather blade beef and the prawns with lemon and pepper and – predictably – deciding it really wouldn’t be a crime to order both. And possibly a bibimbap. But there were limits even to my hunger, so we stopped there. All that food and six bottles of Asahi came to sixty-eight pounds, including a pre-added ten per cent service charge which I had no problem at all paying. On the walk down the hill to the Hop Leaf for a post-meal pint and debrief, I asked Claire how she would describe the clientele at Gooi Nara. Claire had effortlessly clocked all the other diners, their nationalities and the likely market for Gooi Nara’s food, all while pretending to listen to me talk about the Maillard reaction. She’d had her back to the lot of them. 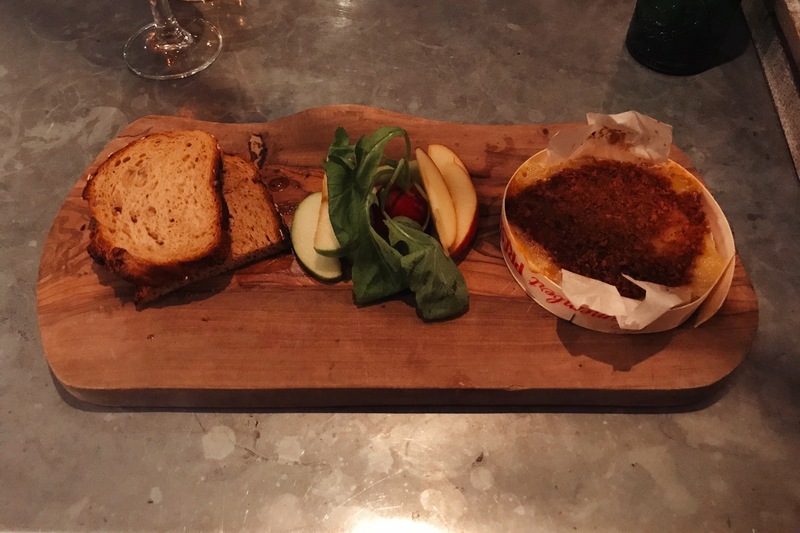 It was like something out of The Bourne Identity, and not for the first time I found myself thinking that if she starts reviewing restaurants regularly it might be the end of my blog. It was a suspicion compounded when we compared notes in the pub about what ratings we’d give Gooi Nara: they were a cigarette paper apart. I’ve thought a lot about the right word for my visit to Gooi Nara since the meal, and it boils down to a really simple one: it was fun. Fun is an underrated quality in eating out, I think. So much about restaurants is either po-faced or functional at the moment, and when it’s not it’s the type of enforced jollity and zany fun that always reminds me of mandatory corporate away days. But Gooi Nara was properly enjoyable from beginning to end, with an element of playfulness that set it apart from the formula of starters, mains and dessert. I can imagine going back with a big group of people and mucking in, although the one thing I would say is that the barbecue takes up a lot of space on the table, so things could get decidedly cramped in a bigger group. But that aside, Gooi Nara comes highly recommended and I’m really looking forward to going back. Having fun, eating great food and making new friends: I wouldn’t be at all disappointed if this visit, too, becomes as much a metaphor as a meal.